2. 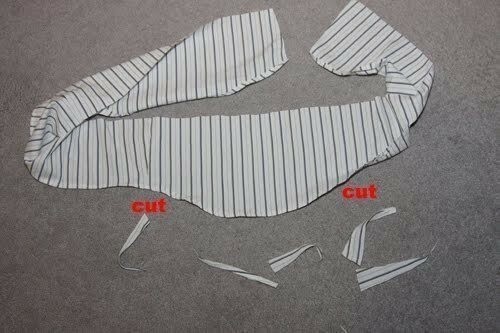 To make the front insert, first cut the sleeves as shown - you'll be cutting the cuffs off both and discarding. 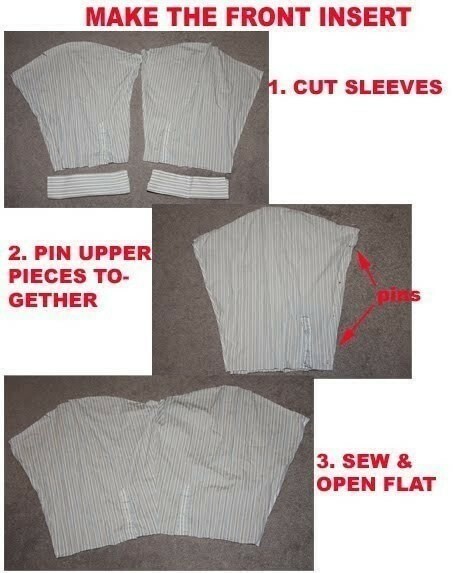 Pin the sleeves together on the long side closest to the sleeve opening placket. 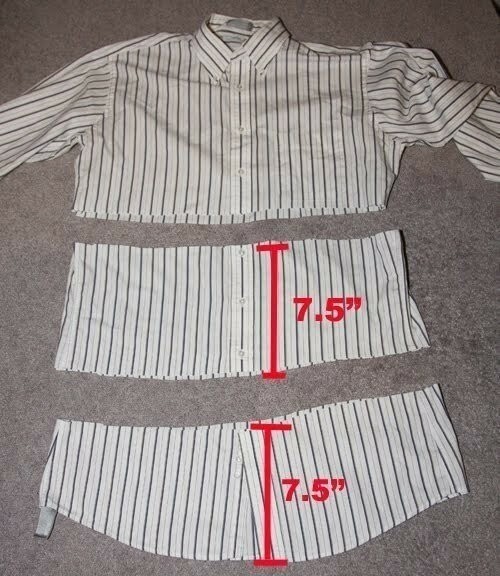 Sew together with a 3/8" seam allowance, open up the piece you just sewed, and lay flat. 6. 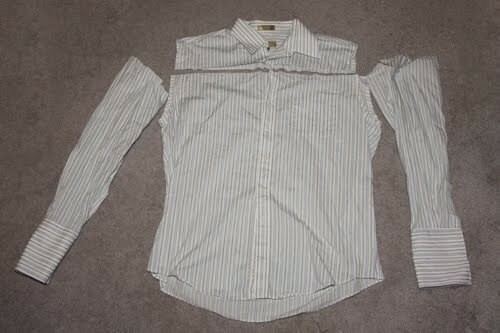 Button up Shirt #2 and lay flat. Mark 7.5" up from the bottom, and 7.5" above that. Cut shirt straight across, through both layers, at both marks. 8. Cut Shirt #2 according to the photo below: cut the sleeves off, and cut the yoke off the back (we'll use the yoke later on). Sew sleeve pieces together. 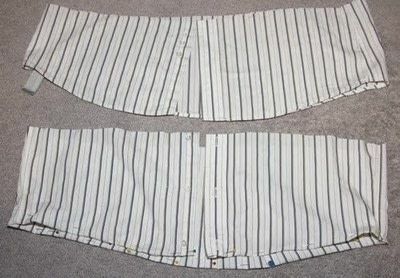 Hem edge that has the rounded part of the sleeve caps in a similar fashion to the piece you hemmed in Step 7), cutting off the extra to create a similar hemline. 10. 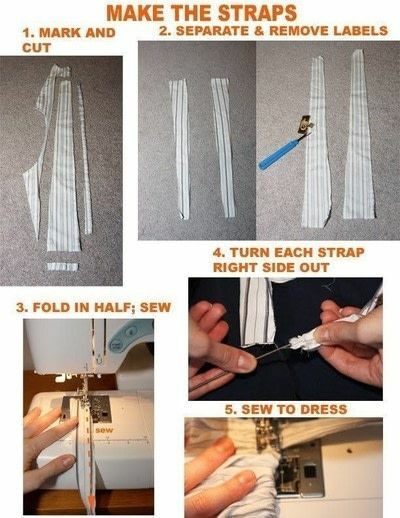 Make a double knot in the end of your elastic cord. Place it on the wrong side, along the top of the ruffle piece you just sewed (about 3/8" from the edge). 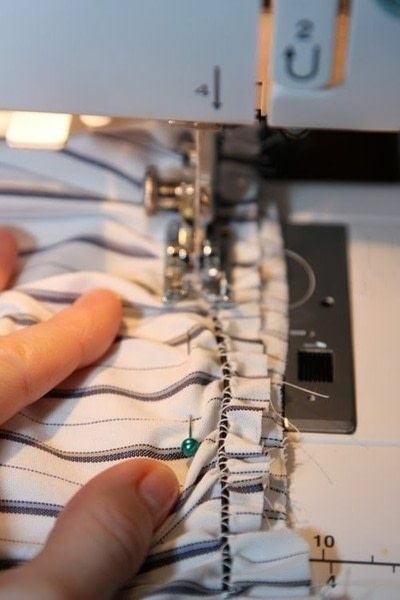 Using a loose zigzag stitch on your sewing machine, zigzag over the elastic cord all the way around the ruffle piece. 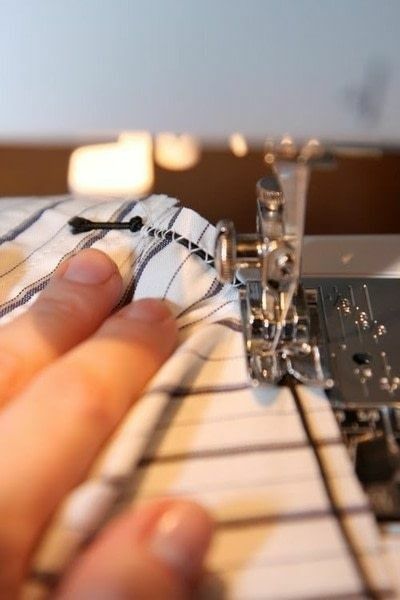 Do not stitch through the cord - it must remain free and moveable under your stitches. Backstitch a couple times at the beginning and end of your stitching to strengthen it. 12. 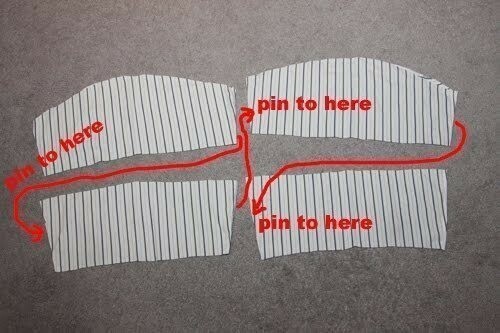 Pin the gathered ruffle to the bottom of the dress, right sides together. The bottom of the dress is already a curvy hem - pin the straight side of your ruffle around these curves. 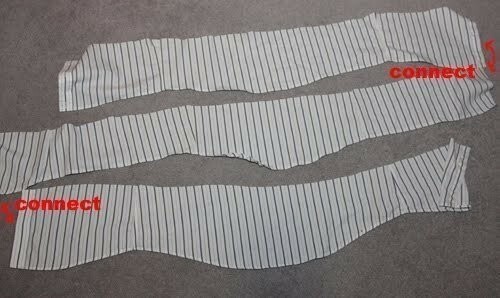 This will create a beautiful wavy hem when finished. 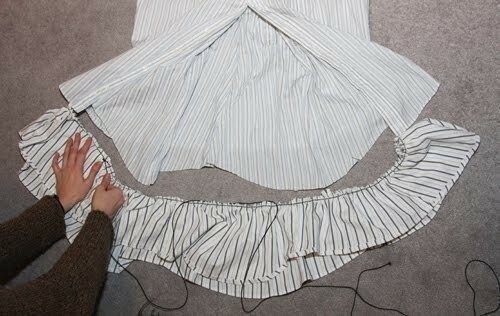 Double-knot elastic cording again once you have verified the pinned length of the ruffle - then cut off the extra. GATHER THE DRESS TOP14. Fold under top of dress about 1"+. 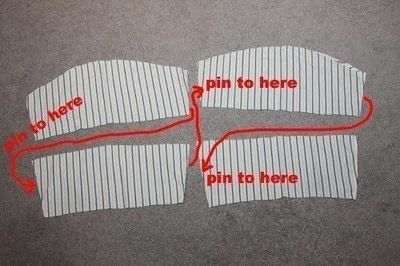 Stitch straight across bottom of folded edge to create a casing. 17. Hold the elastic firmly and gather the front fabric - the finished width of your dress front needs to be 11.5". 19. 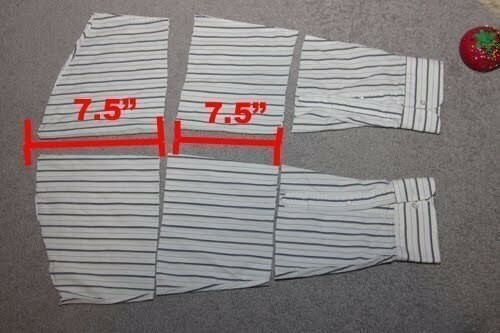 Repeat for the back of the dress - the finished length for the back needs to be 10.5." You're done! The top (and back) should look like the above photo. 21. Sketch out the following shape onto both pieces: a tall trapezoid, with the top side 1.25" wide, the bottom 2.5" wide, and the entire piece 17.5" tall. 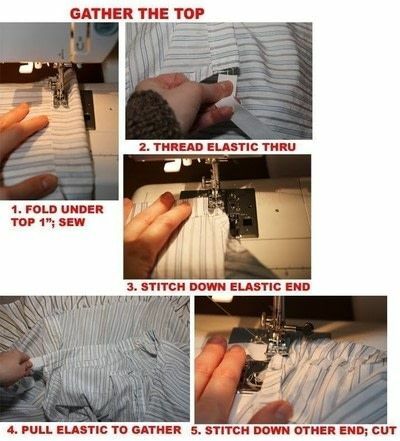 Cut shape out, separate the front and the back, and remove any labels with a seam ripper. 23. Pin each piece under the top of the dress, at both front and back, about 1/2" down from top hem, on either side. I positioned the pieces matching the dress body at the front, and the pieces matching the ruffle at the back. You now have a super-cute dress perfect for lounging about, a sweet babydoll nightie appropriate for the boudoir - or even, under a blazer and over jeans or leggings, a chic piece to add into any day ensemble. Or you can wear it out as is during warmer months - rocking it with some lace-up sandals, a little metallic clutch, and a rhinestone clip in your hair. 3. Though I've followed the directions exactly for making the shoulder-bows, I find them too thin - the bows aren't full and pretty, but instead look skimpy - like dragonflies perched on my shoulders. I would recommend if you wanted fuller bows - to either use fabric from other parts of the shirt and double the width of the cut parts...or cut the pieces as I wrote above and instead of folding them in half, just fold under the raw edges about 1/4" and topstitch to keep in place (eliminating Step 22)- thus leaving you with single-layer fabric bows instead of double-layer. The finished dress may be somewhat short for some people -I've thus recommended an XL men's shirt to hopefully deal with the length problem. Making the ruffle 8" or 8.5" high before you cut it out may also help with this if you're concerned about the length - I am 5'6". 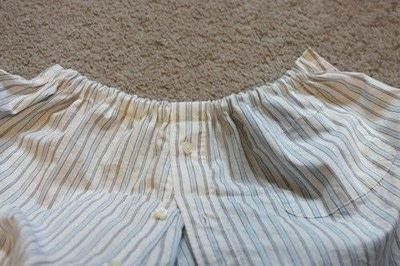 I'd also recommend ironing your shirts first! My blue-striped shirt was a little rumply - which is reflected in the finished piece. The dress is now extremely difficult to iron due to all the ruffles - so make sure your shirts are free of wrinkles first! @krissalee: Thanks! I hope you had fun making the dress - the end result is pretty cute despite its humble origins! 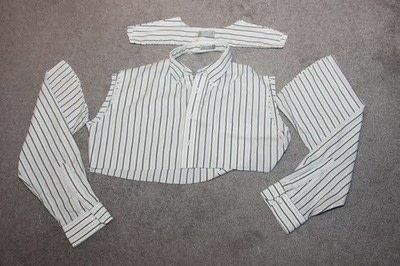 @meg c.: It doesn't matter for the second shirt; you won't be using that part anyway. 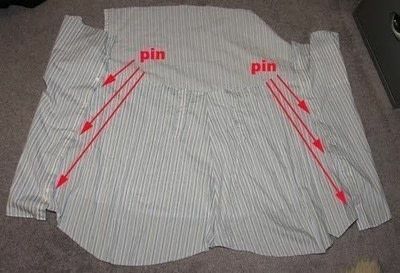 For the first shirt that you use for the body, the pocket will end up kind of under your left armpit. It will be visible if you don't remove it, so it's up to you! tooo cute, you are very talented! This dress is so cute It was one of my first solo sewing projects! You're steps are super easy to follow. Thanks! 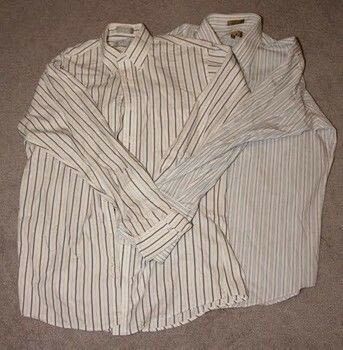 If the dress shirts have pockets on them, should they be removed before making the dress? i love it!!! but what do i do if i wanted the collar to just be straight-ish across?